Meghalaya Diary: the Gorkhas, Migrant Nepalis and India | United We Blog! The person had more questions later when we met: Why do you think Nepalis are harassed in Meghalaya when they intensify their demand for statehood in Darjeeling? Why were Nepalis evicted from Bhutan around the time Gorkhas were agitating in Darjeeling? 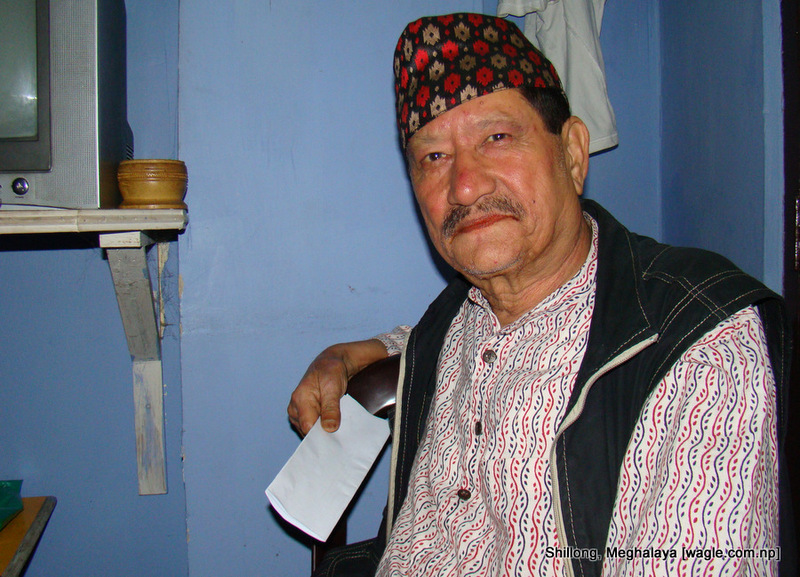 Who really killed Madan Tamang (two weeks ago in a gruesome day-light murder in Darjeeling) at a time when the Gorkhaland movement had reached a crucial stage? Don’t you think the Indian government is unnecessarily worried about the possible movement for greater Nepal (of pre-Sugauli treaty days)? Don’t you think the Indian establishment is doing injustice to Nepali speaking Indians by not trusting their commitment to the Indian union? When the ex Nepali ambassador to India Bhesh Bahadur Thapa visited Guwahati in 2002 he was reportedly the first Nepali envoy to visit the region since 1967. He complained about the uncooperative attitude of the Indian foreign ministry that dissuaded embassy officials from going to the northeast citing the lack of security. Last year two diplomats from the Nepali embassy in Delhi visited Guwahati in their personal capacity to take part in a program that a Guwahati-based literary group had organized with the financial assistance of Nepal-India joint venture BP Koirala Foundation. Later they complained of not being allowed to interact with the Nepali migrants in the city by the ‘organizers’ who, the migrants suspect, were under pressure from the Indian establishment. Despite all the turmoil on the streets and political instability, Nepal, it seems, is more peaceful and hospitable. Indian envoys are not only allowed to visit but very much welcome in any part of the country including the picturesque Mustang valley bordering China. PS: On the last day of my stay in Shillong, as I was preparing to leave for Guwahati to catch a train to Delhi, a smiling and soft-speaking Gorkha came to see me. “I work for the MHA,” he said meaning India’s Ministry of Home Affairs. “IB?” I asked meaning Intelligence Bureau. its my weakness not to know much about the nepali political background . i was born and brought up at darjeeling and what i know about my forefathers is that they came from nepal at the time when india was still under the mughals.i dont know if people are aware that the india today was known as mughlan (land of mughals) then. thats the reason why i dont know the history clearly about the nepali people migrating in india .inspite of this long history,as per india today and its constitution any indian born in india is equally indian as the others .however darjeeling today and people residing here is still struggling for their own identity. i was quit small when i went to chennai to visit my cousions . i had new friends there . they use to ask me “hey , i havent seen you here before ,where are you from?” and i replied ” i am from darjeeling” he was silent for a moment and asked ” foreign country.isnt it ?” . then was the first time i realised about our identity . my own cousions wanted not to speak in nepali with him ,even though he himself is a nepali . i am now 27 and workiing with aegis ( a bpo company) in gurgaon . and hardly many people know about the movment in darjeeling . we are fighting for our rights and our identity . we hve a different culture and way of living then why should we serve the bengal government? i am a layman as far as this movement is concern ,but what i know precisely is our fight ,our identity & our coulture . india is not the only country we can live on .the world is big nough . if we can migrate in india ,as the so called mainland indians say , we can also propose the government of countries like the U.S ,U.K and even nepal for shelter . we can make this small issue as international and abandon india or we gorkhas are brave enough to take weapons for our fight and noone can stop us . however these iseas are not appropriate . we love our motherland more than any other indian do . we have given our lives in many battels and wars for the safety of mother india . however our bravery and honesty is been paid back with that foreigner look in the mainland indian eyes . I am Gorkha and I support GJM. Indian Gorkha’s should have separate state and recognition. Good article and hope lots of Nepali of Nepal read it and then realize that same applies to “Madhesi” people who may look like Indians but aren’t. The other point is that Nepali always like to be very passionate about the possibility of a Greater Nepal however, it doesn’t look like a shared thought by people of Nepali origin who rather feel Indians than Nepalese. Keep current political fiasco and short sighted vision going in the country and even the Nepal you have today will be difficult to handle let alone the dream of Greater Nepal. It is very true that Gorkhali people of Meghlaya are harassed badly and killed many times , and till date Indian govt is silent. 1/3rd of Nepal’s land fall in India but Indian origin people in Nepal are safe but about Nepali Indias in India, Is India’s world’s largest democracy to make inoocent nepali speakers as soft targets. why was India govt so silent when in 1987 more than 50 thousand Gorkahli people in Meghalaya were homeless within a week. why is India govt so much against gorkhas when in 2010 a 70 old cow herd was burt alive. why ?? Thank you for taking time to write about my people.